a. The part of a garment that encircles the neck, especially when raised or folded. a. A restraining or identifying band of leather, metal, or plastic put around the neck of an animal. b. The cushioned part of a harness that presses against the shoulders of a draft animal. 4. Biology An encircling structure or bandlike marking, as around the neck of an animal, suggestive of a collar. 5. Any of various ringlike devices used to limit, guide, or secure a machine part. 6. Slang An arrest, as of a criminal. 1. To furnish with a collar. a. To seize or detain. b. To arrest (a criminal, for example). 2. (Clothing & Fashion) any band, necklace, garland, etc, encircling the neck: a collar of flowers. 1. the part of a shirt, coat, dress, blouse, etc., that encompasses the neckline of the garment and is sewn permanently to it, often so as to fold or roll over. 2. a similar but separate, detachable article of clothing worn around the neck or at the neckline of a garment. Compare clerical collar. 3. anything worn or placed around the neck. 4. a leather or metal band or a chain, fastened around the neck of an animal, used esp. as a means of restraint or identification. 5. the part of the harness that fits across the withers and over the shoulders of a draft animal. 6. Zool. any of various collarlike markings or structures around the neck; torque. a. a raised area of metal for reinforcing a weld. b. a raised rim at the end of a roll in a rolling mill to check lateral expansion of the metal being rolled. 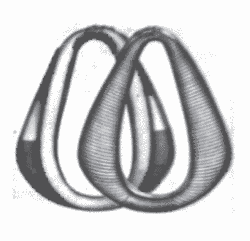 8. a short ring formed on or fastened over a rod or shaft as a locating or holding part. 9. the upper rim of a borehole, shot hole, or mine shaft. 11. to put a collar on; furnish with a collar. 12. to seize by the collar or neck. 13. to detain in conversation. 14. to place under arrest. A band of leather or cloth stuffed with straw or sawdust that fits around a horse’s or mule’s neck, rests against the animal’s shoulders, and presents a broad, firm, load-bearing surface to the shoulders. banding, stria, striation, band - a stripe or stripes of contrasting color; "chromosomes exhibit characteristic bands"; "the black and yellow banding of bees and wasps"
3. collar - anything worn or placed about the neck; "the thief was forced to wear a heavy wooden collar"; "a collar of flowers was placed about the neck of the winning horse"
hoop, ring - a rigid circular band of metal or wood or other material used for holding or fastening or hanging or pulling; "there was still a rusty iron hoop for tying a horse"
8. collar - a figurative restraint; "asked for a collar on program trading in the stock market"; "kept a tight leash on his emotions"; "he's always gotten a long leash"
restraint - the act of controlling by restraining someone or something; "the unlawful restraint of trade"
9. collar - the act of apprehending (especially apprehending a criminal); "the policeman on the beat got credit for the collar"
Verb 1. collar - take into custody; "the police nabbed the suspected criminals"
3. collar - furnish with a collar; "collar the dog"
verb (Informal) seize, catch, arrest, appropriate, grab, capture, nail (informal), nab (informal), apprehend, lay hands on As Kerr fled towards the exit, Boycott collared him. Slang: bust, pinch, run in. Because the American Red Cross and other guard-training organizations don't cover the use of cervical extrication collars, most aquatics facilities don't use collars in their spinal-injury management protocols. Premier Purchasing Partners, LP, today announced new agreements for orthopedic soft goods, including cervical extrication collars, with Aspen Medical Products, Inc.
OSHA standards have also had a major influence on pre- hospital equipment manufacturers, particularly those of backboard and extrication collars.